Dubai: Gulf News, the leading newspaper in the UAE and GCC region, continues its strong support for the development of horse racing in the UAE by its sponsorship of Thursday’s full card at Meydan Racecourse. The highlight of the evening is the Group 2 Bani Yas, a key event for Purebred Arabians, which ushers in the Pattern race season at the iconic venue. 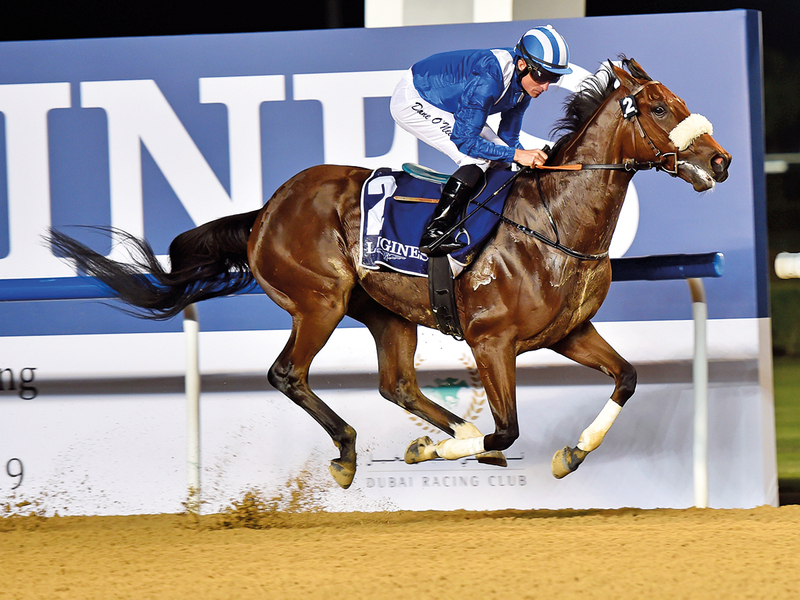 A full field of 14 horses, led by last year’s emphatic winner, RB Torch, go to post in the 1,400-metre dirt contest, which boasts a purse of Dh195,000. Caulfield Cup winning jockey Pat Cosgrave takes the ride on RB Torch, who is joined by stable companion Mawahib. Al Asayl’s Eric Lemartinel is responsible for both the highly regarded Arabians. The co-feature is the gulfnews.com conditions race, which has attracted a competitive field of 12 runners including the reputable Cosmo Charlie, one of five racing out of reigning champion trainer Doug Watson’s stables. The pick of stable jockey Pat Dobbs, this will be Cosmo Charlie’s second appearance this season, but first at Meydan, where he will be looking to give a better account of himself following a big of a lukewarm season debut at Jebel Ali Racecourse, where he reportedly suffered minor injury. Cosmo Charlie looks our best chance, along with Thegreatcollection. Both are proven under these conditions and working very well. Watson also sends out Thegreatcollection, who will be partnered by his second stable rider, Sam Hitchcott. The trainer said: “Cosmo Charlie looks our best chance, along with Thegreatcollection. “Both are proven under these conditions and working very well. They have also been fortunate with decent draws. The American also saddles Active Spirit (Tadhg O’Shea), Ertijaah (George Buckell) and Nathr (Fernando Jara). The latter pair represent Shaikh Hamdan Bin Rashid Al Maktoum, Deputy Ruler of Dubai and Minister of Finance, who also looks to have genuine claims of winning the contest, with Taamol. Trained by Ali Rashid Al Rahyi, who says he is confident of having a strong season, Taamol drove home the point by winning a 1,400-metre Meydan Handicap a fortnight ago. Al Rahyi said: “This is a horse we have always really liked and are hoping can have a productive season; his second in the UAE. “He looks a better horse than he was last year, and seems to have trained on. This is a much tougher race, but we believe that he will run well. First-season handler Sandeep Jadhav also runs three with stable jockey Royston Ffrench electing to ride Montsarrat, leading Xavier Ziani to partner Hornsby and Richard Mullen Syphax. The trainer said: “We think both Montsarrat, who is normally very consistent, and Hornsby should be very competitive and both have drawn well. Meanwhile, the Phoenix Ladies Syndicate, who are fast creating a name for themselves as a successful team of owners, will be hoping to pick up their third winner of the season with Ariette Du Rue, who faces nine fellow juveniles in the Inside Out, fillies’ maiden. Both the syndicate’s Meydan winners have been trained by Ahmad Bin Harmash and ridden by Connor Beasley, who teams up again with Ariette De Rue, a daughter of Street Sense who is bred to race on dirt. Another interesting local debutant is the Esmail Mohammad-trained and owned Al Hayette, who brings with her some strong UK form having run one second and one third from three starts. 1. AF Al SAjanjle, 2. RB Torch.